Commissioner Aresco has said over and over that the American Athletic Conference needs to be built around football. No surprise, of course, when you consider that seems to control the money. But the American is completely devoid of any football heavy hitters – at least at first glance. So it got me thinking, are there more basketball or football schools in this reinvented league.\? Let’s look forward to how the league will look in 2015 for our study. 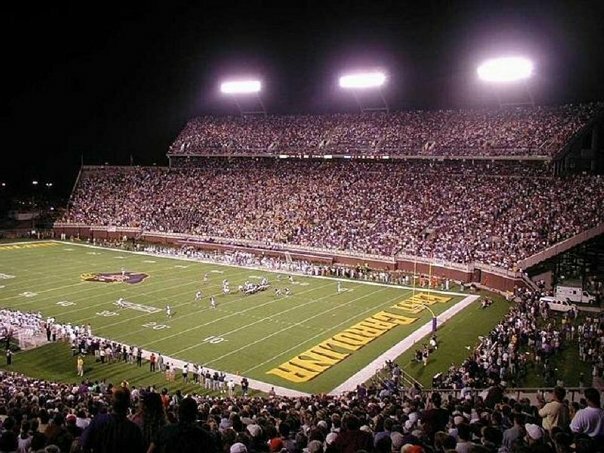 With nearly 50,000 fans per football game, and less than 5,000 in basketball, it’s easy to see which sport ECU favors. We’ll consider factors like program winning percentage, attendance, reputation, recruiting power, and the eye test. Central Florida. I really do believe that this athletic department is a sleeping giant. The school is just gargantuan (over 50,000 students), the recruiting bed is hot, the facilities are great and now they’re in a league that will give them greater exposure. In the grand scheme of things, this university is pretty new to college athletics and things could change one way or the other. But with their football program scheduling games across the pond to play Big Ten opponents, I’ll give football the edge. Cincinnati. Can’t deny what the Bearcats have done on the gridiron. Pre-Big East Bearcat football was abysmal. 14,000 fans came out to watch struggling 4-7 teams host middling Conference USA programs. But exposure, a nicer payout, and a string of quality coaches elevated the program considerably (five 10-win seasons in the past six years). Still, this is a basketball school. Without doubt. It’s produced a plethora of key NBA players, final four teams, and two national championships. Hoops in the Queen City is a big deal. I’d be curious to see where this is in 10 years. Connecticut. Besides a Fiesta Bowl appearance and loss following an 8-4 season, this school is really only a basketball school. And a mighty fine one, at that. Three national championships in men’s hoops and an unprecedented eight championship wins in women’s. UConn is synonomyous with college hoops, and even with Jim Calhoun retired, this will be a brand and force to be reckoned with for years to come in basketball. East Carolina. Our first sure-fire football school on the list. The Pirates will come into the league and immediately showcase the best fan support amongst league members, not to mention a few marquee victories in recent memory. The fan support is almost an anomaly in a way; they haven’t had the kind of success that would warrant 45,000+ fans to show up every Saturday, and the school shares territory with four other ACC schools in the same state. Still, they make it happen. And the basketball program doesn’t (1004-1018 total record). Houston. Things could be on the up and up for this school. New league and a shiny new football stadium could mean greater exposure, recruiting and performance for all sports. But, historically, basketball clearly has the edge here – if for no other reason than its great run in the early 80s when it was a two-time runner up in the tournament. On one hand, you have to be glad the conference secured a small chance to compete against a “Power 5” team in the postseason (if you want to call the ACC a power conference). On the other hand, you can’t be happy about the American’s 3-6 choice of teams playing the ACC’s 7-10. I’ve seen the ACC standings before. It doesn’t look pretty past the top three or four teams. We could very easily be seeing an 8-4 Houston Cougars team squaring off against a 6-6 Wake Forest squad. Kind of an insult, really. 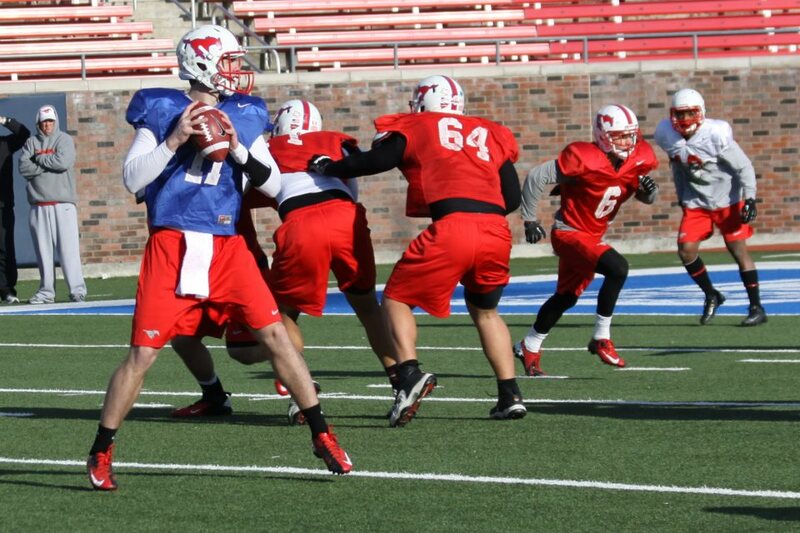 I know the bowl picture is still shaping up. I know it’s important to have chances for the American to play marquee conferences. But what I’d really like to see is the conference to have the chance to play the best teams. Heck, give me the top, or even second-best Mountain West team to play against. 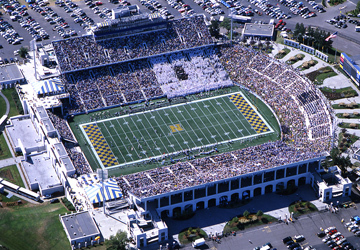 I guarantee it’ll make for a better football experience than watching a lower tier ACC school bring all 40 of their fans to Annapolis for a snoozer of a game. You certainly have to appreciate the location of this bowl though. It’s right in American Athletic Conference territory and will be played in a fine stadium. And, if it helps the American rack up more wins against the ACC, I guess that can’t be so bad, either. Have any thoughts on the new bowl? Share below in the comments. Should the American Athletic Conference Have Added UMass? I think it’s pretty universally accepted that at the time they added Tulsa that they were the best card left on the table. However, rumors were spreading that the University of Massachusetts was under heavy consideration. Should the American (then Big East) have added the Minute Men instead? Should the American have considered UMass? It’s hard to make an argument athletically for a school that has only one season of FBS play under its belt, and a terrible one at that. But name recognition means something, and that’s why I always thought they were an interesting case. The American is short on state flagship universities, with UConn being the only one. The conference is a collection of second-bests and under dogs in their own states. Quality schools, no doubt. But name brand flagships, they are not. Take a peak at any of the remaining “Power Conferences” and you’ll see a number of schools that are the academic and athletic flagships in their state. Look at any of the lower conferences and you’ll see they’re lacking. 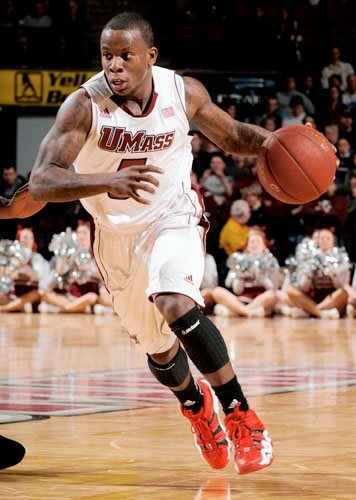 The other reason UMass sounded like such a good idea is that it gets the American away from the whole Conference USA 2.0 mantra. UMass has a different feel than those schools: a New England footprint school with good hoops, a great college town in Amherst, quality academics, and loyal alums. At the end of the day, Tulsa is probably the better bet. But UMass would have added a nice flavor, and I’m sorry they aren’t a member of the league. As of yesterday, the American Athletic Conference is a real thing now. With real teams and a real website. But we know nothing is real until it’s proven on the field and court. That’s why we need a checklist of the things that need to happen for the league to get credibility over the next year. 1) Louisville needs to win a lot, but not win it all in football. It’s hard to deny the kind of exposure U of L is going to give the conference in its last year as a member. This has long been one of the most underrated athletic departments in the country, and it finally has the kind of attention it really deserves. People will watch the Ville on TV because it’s them and might even forget they’re in the American – which is the root of the problem. Louisville relevance for one year is good, but them winning it all spells doom for the future of this league. Cincinnati or Central Florida representation in the league’s final BCS game would go a heck of a lot further for the league than one of the games showcasing another outgoing member. Here’s to hoping the Cardinals finish 10-2 (5-2), and not 12-0. 2) Win out-of-conference games in all sports. Football is the big one here because the opportunities are so huge. Connecticut gets Michigan, USF gets Miami, Cincinnati plays Purdue, Central Florida gets a home date with South Carolina. Win even half of these games and people will stop joking about this conference really quickly. The opportunity is certainly there. 3) Put five teams in the NCAA men’s basketball tournament. It shouldn’t be too hard with Louisville on the slate for 364 more days. But this is far from a cake walk. This essentially means every team that is being heralded as a basketball power in this league (Uconn, Cincinnati, Temple, and Memphis) need to perform. In the off chance that an SMU or Central Florida decide to join the conversation, it could mean a bright future. If Louisville only joins a pair of other schools, be prepared for the dark ages. 4) No academic scandals. 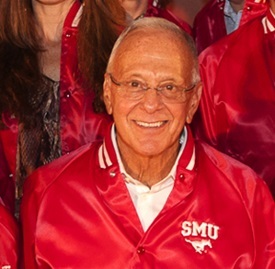 No more postseason bans, no NCAA probs, no recruiting violations, no SMU players receiving payrolls (Sorry, I had to). On and off the field, this conference needs to be first class. 5) Improvements in the academic standings in the US News and World Report. Yes, you read that correctly. And yes, it’s a big deal. Whether or not you agree with how schools are ranked, it’s still used for perception. 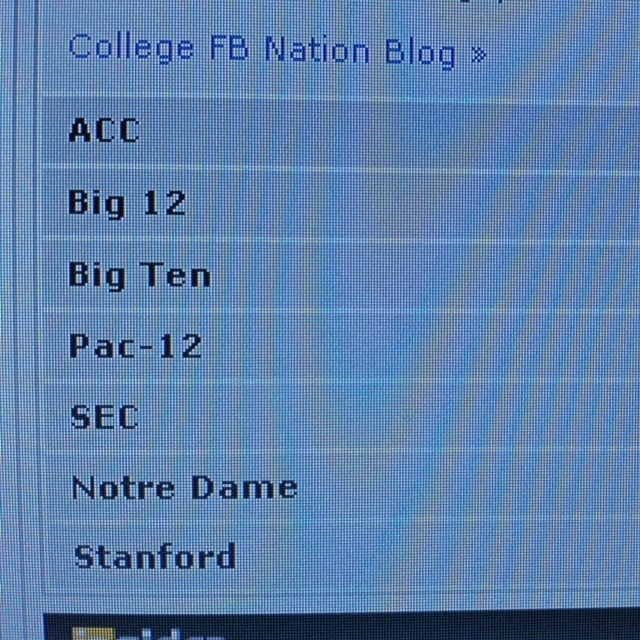 And right now, the American is solidly behind the ACC, BIG, Big 12, Pac 12, and SEC in academics. Alumni giving is a huge component of that, and schools with great athletics tend to do better in alumni giving (seeing the connection here?). If the schools start being recognized as great institutions, the image of the conference will only be enhanced. Can you think of better things the league needs? Let us know below! If you need any more proof that the American is going to be treated like a second-class conference, look no further than ESPN. It started with the network offering the conference a whopping $1.8 million per year media deal (if it wasn’t so sad, I’d laugh), but now they’ve actually eliminated the Big East Blog from their website. Granted, the name Big East no longer pertains to this collection of teams, but instead of simply replacing the blog with the American Athletic Blog, they’ve taken it down altogether. You could kind of tell this was going to happen for a while now. It seems like they always stick a new writer on the blog who clearly doesn’t want to write for it, then promotes them to a different blog months later. There was never any real continuity or passion for the conference – just some hungry journalists’ stepping stone. But, like it or not, this was a great way for a lot of fans to get updates on the teams from this conference. Now it’s gone. I have no doubt the blog was still being read daily by thousands of fans, so I don’t think the reasoning was monetary. The network wanted to send a message that the American Athletic Conference is a clear step below the “Power Five”. 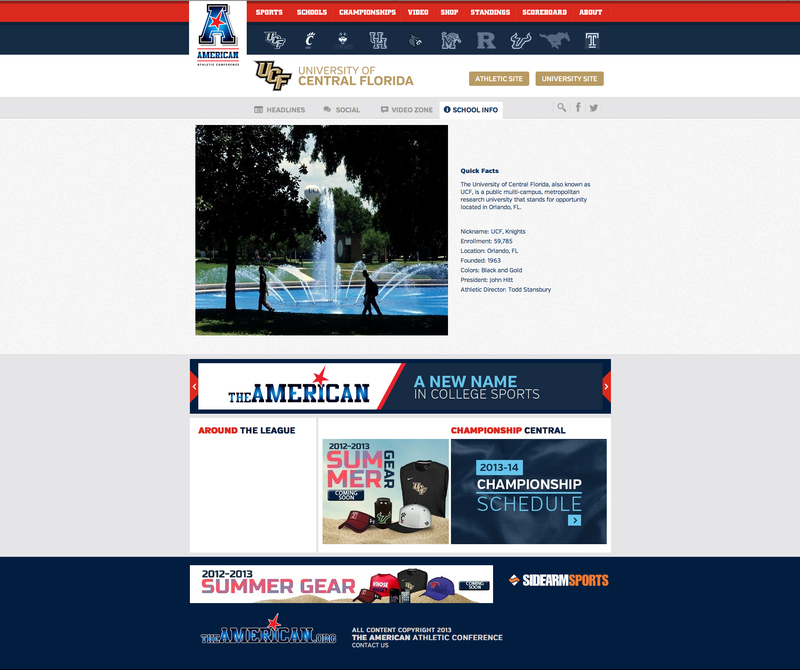 It looks like we’re getting a sneak peak of the new American Athletic Conference website (theamerican.org) before it’s officially launched on July 1st. It’s very clean, easy to navigate, modern, and offers a lot of good information. One of my favorite features is the little profiles and quick facts they give about each university that go beyond simple athletics; they even include each school’s PSA. I think it’s important for this league to brand behind the power of the schools on an institutional level instead of just the playing field. Well done, Mr. Aresco. If we’re comparing this site to the other major conferences, I’d say the American did a pretty fine job. Having this site be a success is absolutely imperative to the future of this conference and they needed to get it right.